New Performance in Marbella Confirmed: On Saturday, June 30, Sting will perform at the Hotel Puente Romano Tennis Club in Marbella, Spain. For this concert, he will be joined by Dominic Miller (guitar), Vinnie Colaiuta (drums), David Sancious (keyboard), Peter Tickell (electric fiddle), and Jo Lawry (vocals). Fan Club pre-sale begin at Monday, June 11 10AM to Tuesday, June 12 3PM . Tickets will go on sale to the public Tuesday, June 12 10AM. All times local time. Hi! I was one the lucky few who enjoyed Sting's concert last night in Marbella. I just wanted to say what a fantastic experience it was. Sting was top-notch as always, and the band were amazing. Shame that people chose to remain seated for most of the concert, I was deeply saddened and upset by this. Hello again! 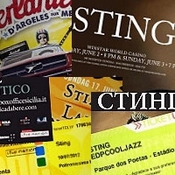 Can someone from the Sting.com team give me an answer as to why the gig in Tenerife was cancelled please?!? Thanks. Hello. Tenerife cancelled?!?!?! And why would this be?! Has it been swapped to another date?! What happened?! Live Nation have been notified. Waiting for them/the promoter to fix. Why isn´t it working???? I can´t buy them because it says that the code is not correct!! Happened for the cancelled Tenerife show too... just that this time there is only 1 day for the fans!!! Help please! !